The genetic and molecular make-up of individual breast tumors holds clues to how a woman’s disease could progress, including the likelihood of it coming back after treatment, and in what time frame, according to a Cancer Research UK-funded study published in Nature today (Wednesday). 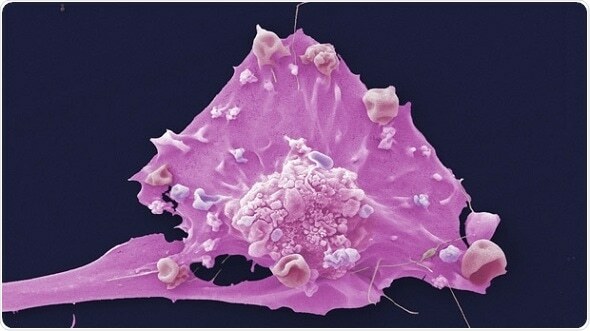 In the first study of its kind, scientists at the Cancer Research UK Cambridge Institute at the University of Cambridge, in collaboration with Professor Christina Curtis at Stanford University, examined the patterns of genetic changes within tumors from nearly 2000 women with breast cancer and followed their progress over 20 years – including whether their cancer returned. They used this information to create a statistical tool that can better predict if, and when a women’s breast cancer could come back. While the genetic analyses used in the study are too detailed for everyday use, the team are now working on a routine test that could one day help doctors offer women a more accurate prediction of if, and when their disease may return. Although not available to patients yet, this means that in the future, treatments and follow-up can be tailored, improving women’s chances of survival. Treatments for breast cancer have improved dramatically in recent years, but unfortunately for some women, their breast cancer returns and spreads, becoming incurable. For some, this can be many years later – but it’s been impossible to accurately predict who is at risk of recurrence and who is all clear. The latest findings highlight how these molecular subtypes have distinct clinical ‘trajectories’, which can’t be predicted by looking at commonly used characteristics (such as size, stage, estrogen receptor (ER), or Her2 status) alone. These clinical trajectories vary considerably, even between tumors that seem similar. For example, the team found, among women with a form of the disease called triple-negative breast cancer, there was a distinct subgroup whose outlook is initially poor, but for whom the disease is unlikely to come back in those who survived 5 years. They also identified subgroups of women with estrogen receptor-positive (ER+) tumors, who were at a higher risk of their cancer coming back up to 20 years after they were first diagnosed. Around 12,300 women in the UK could belong to one of these late relapse subgroups and therefore might benefit from longer courses of treatments such as tamoxifen, or more frequent check-ups. The model also revealed how molecular subgroups could behave very differently if a patient’s cancer returns. They commonly spread to different parts of the body and some are more aggressive than others, affecting how much time women survive for following a relapse. This study provides some valuable new insights into how we might identify women whose breast cancer is likely to return. In addition to developing an affordable test for future use in hospitals, Caldas’ team are also already investigating personalized treatment options for different breast cancer subtypes. The next steps will be to recruit patients onto different clinical trials depending on the molecular make-up of their tumor. Catharine Scott, 51, from Cambridge, was diagnosed with triple negative breast cancer in 2016. She had the molecular biology of her tumor analyzed as part of the Personalized Breast Cancer Program, part funded by Cancer Research UK at Addenbrooke's Hospital. This program aims to confirm whether women are receiving the best treatment for their tumor type, and if they might be eligible for a clinical trial should they relapse in the future. They can tell you the risks and likelihood, and how things have been in the past. If they were able to make it more personalized that would be more reassuring. It would definitely be better than feeling you have to cross your fingers.